The Angriest: Star Trek Enterprise: "Twilight"
Twelve years after an accident stripped Captain Archer of his long-term memories, the 9,000 surviving members of the human race hide from the Xindi in the Ceti Alpha system. When Dr Phlox returns with a means of restoring Archer's memories, he discovers that it may in fact be possible to change the course of history and save the planet Earth after all. "Twilight" is the sort of episode that Star Trek does all the time, in which characters get to experience an entire lifetime in the course of an episode before everything is reset in the final few minutes. How much you enjoy "Twilight" will depend to a large extent on how tired you are with this kind of story. The Next Generation did it with "The Inner Light", Deep Space Nine with "The Visitor" and Voyager with "The Year of Hell". It's about time Enterprise took its own bucket to that particular well. I'm personally a sucker for these kinds of time travelling shenanigans, and enjoyed the hell out of the episodes I've listed above. "Twilight" is a reasonable addition to the set. I think "The Inner Light" is the unassailable gold standard for this kind of episode, but certain there's nothing here that's anything less than good. Its only shortfall is the lack of originality in the basic structure. The character relationships are what make this kind of episode work, and it seemed very believable that some sort of close, personal relationship between Archer and T'Pol would develop. Jolene Blalock and Scott Bakula play it very well, and the script (originally developed as a Janeway/Chakotay piece in Voyager) doesn't overplay things. There's also a nice science fiction explanation for how Archer's condition works: the parasites that have blocked his memories live outside of space and time, so if Phlox eliminates then in the future then they simultaneously cease to exist in the past. I was happy to see that, by the episode's conclusion, nobody has the foggiest sense that any of the future events ever happened. Why would they, after all? There's a particularly mean in-joke in this episode, as the future human survivors settle on the fifth planet of the Ceti Alpha system. We know from Star Trek II: The Wrath of Khan that the human race has about 90 years before the planet is rendered uninhabitable. Tough break. 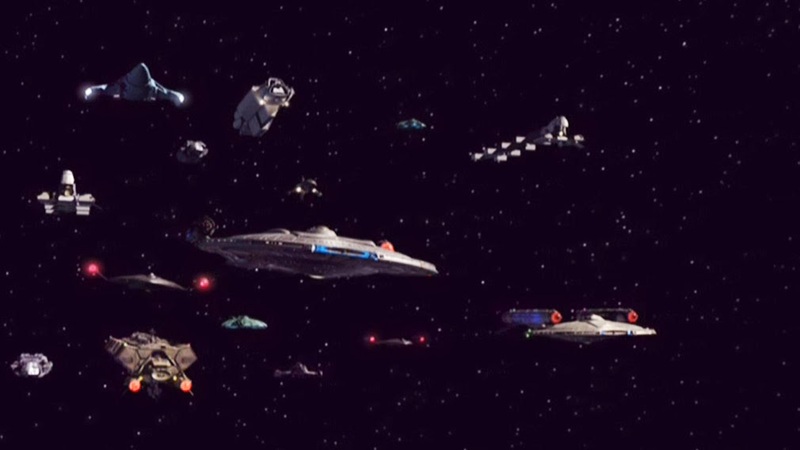 It's also hard not to see the convoy of surviving Earth vessels (pictured above) as a knowing wink at Battlestar Galactica. Another good episode that brings the season's total so far up to five good episodes out eight, or 63%. That's about in the ballpark that Season 1 and 2 ended with, suggesting that after a rough start it's business-as-usual for the crew of the NX-01 Enterprise.